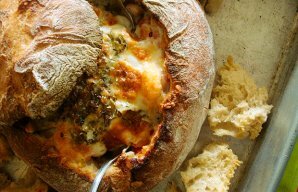 This delicious Portuguese style garlic and parsley bread recipe (receita de pão com alho e salsa) takes only 15 minutes to make. Start by making some cuts in the baguette (the size you want the slices to be). Heat the butter in a saucepan and combine the minced garlic and chopped parsley. Put the baguette on a baking sheet and brush generously with the garlic and parsley butter and add butter inside the cuts made in the baguette as well. Bake at 180°C or 350°F for 10 minutes. 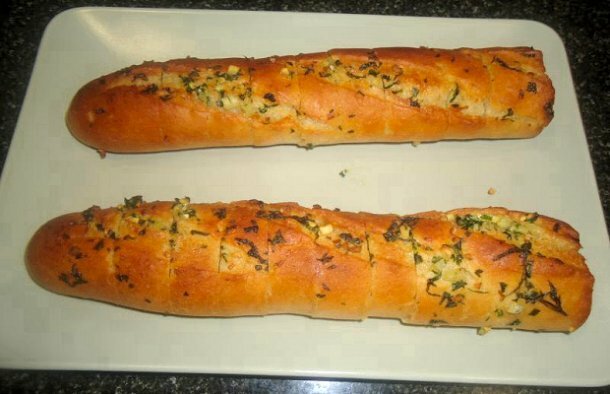 Remove the bread from the oven, cut into slices and brush with the remaining garlic and parsley butter. 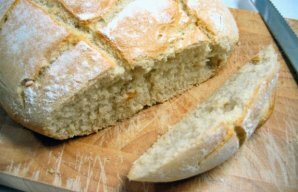 This delicious Portuguese Pyrex bread recipe takes less than a hour to make, enjoy warm. This Portuguese stuffed bread with bacon, mushrooms and shrimp recipe (receita de pão gratinado com bacon, cogumelos e camarão) makes a great entree. 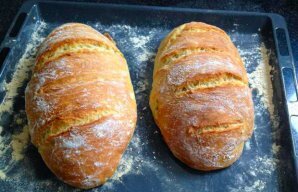 This amazing Portuguese homemade bread recipe (receita de pão caseiro), creates a crusty and delicious bread.